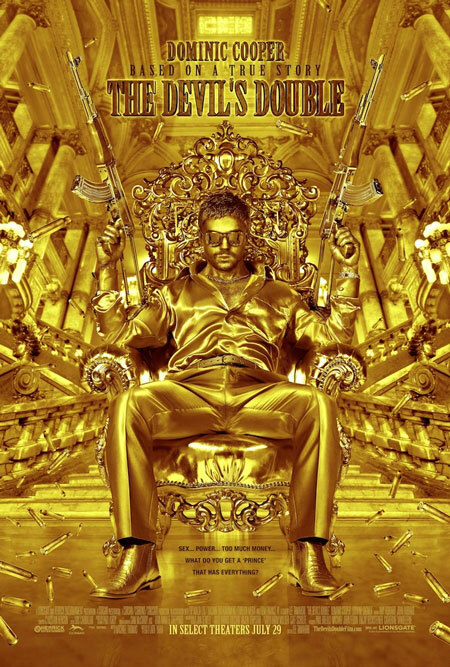 Sure to secure a place in the grand tradition of widely embraced yet largely misunderstood gangster films, Scarface being the obvious example, The Devil’s Double deals with interesting circumstances that take a backseat to violent exploitation and a welcome touch of the surreal. Dominic Cooper does double duty as Saddam Hussein’s womanizing slime of a son Uday as well as the modest lieutenant-turned-Uday body double Latif. Latif’s job is to stand in for Uday during potentionally dangerous situations and careless drug binges. The setting for this true life tale is the late 80s, as is evidenced by the synthpop soundtrack that includes Dead or Alive and Frankie Goes to Hollywood. Cooper treats both roles with a necessary seriousness regardless of the occasional over-the-top absurdity of Uday’s actions, which include rapes, child abductions, and the brandishing of excessive weaponry. His taunting sneer will surely make its way to designer urban t-shirts and county fair poster prizes in no time. Accomplished French actress Ludivine Sagnier, an Ozon regular, is almost unrecognizable in her role as the requisite love interest while Australian-born theater actor Philip Quast does a spot-on Saddam Hussein (presumably so, at least). And speaking of which, this is definitely the only film that will ever feature twin Saddams playing tennis…it’s worth the price of admission alone. The Devil’s Double opens today at the Ritz East.